BEWARE of Parenting Under ‘Nanny State’ Next Door Neighbours – if this sounds crazy to you, that’s because it is. I was invited on to the Michael Graham Show on talkRADIO talking about this parenting story in America. It struck a cord with me as I’m locked into a bit of an unpleasant situation with my next door neighbours after I trimmed their overhanging branches in my garden. They’ve suddenly put up a huge Razor Wire fence with rolls of highly dangerous Razor Wire on my land, and I’m worried about my two cats getting hurt or injured on it but imagine this…. ‘It started out as a perfectly normal day. After a busy summer, my daughter and I were looking forward to a rare day free of organised activities. Over breakfast on our patio, I told her, “Today we can relax and all you have is a play date this afternoon. The only thing we have to do today is work on Marshy’s dog training.” A good plan I would live to regret. My daughter walked her tiny Maltese dog, Marshmallow, by herself (the norm in my neighbourhood for kids). From where I was in our yard, I could see and hear her nearly the entire time. Then a neighbour called the police. The neighbor actually told the police a 5-year-old was out by herself. The cops checked in on my family and reported back to the neighbor that I had done nothing wrong and was not endangering my child for letting her walk her dog. Apparently wanting to see me hauled away in handcuffs in front of my kid, the same neighbor decided to call the Illinois Department of Children and Family Services (DCFS), which launched a weeks-long investigation for neglect. All because my daughter walked her dog. If this sounds crazy to you, that’s because it is. I would soon learn, however, that in America reporting mothers to the authorities because an onlooker disagrees with her parenting is shockingly common. My family is fortunate. We stretch to rent in a beautiful, safe area outside of Chicago. But our society is particularly judgmental of mothers and people are fond of forcing their ideas on other parents. Parenting will make you keenly aware of just how valuable some people think their opinions are. Aside from completely traumatizing my daughter — nightmares, paranoia, anger — the whole situation was particularly ironic. I home-school my kids year-round, which means I am with them practically 24/7. I am actually that annoying mom you secretly think really needs to get a life: I cut off crusts, cut grapes in half, carry Band-Aids, hand wipes, rain ponchos, tissues and snacks wherever I go. Just in case. 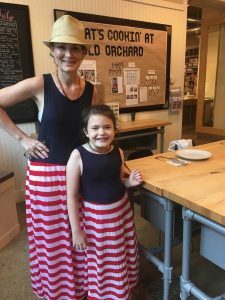 I have a plethora of matching outfits with my daughter, worry constantly and all I talk about is my kids (yes, I even annoy myself). Perhaps ironically, one of the biggest criticisms home-schoolers face is the question of how our children learn to become independent. If it seems like you literally just heard my eyes roll, it’s because you did. I’m an older mom, having my second child at 40 years old. I lived with a decade of infertility, lost a baby and I have health concerns. I face every day acutely aware that my time with my children is limited, fleeting and so precious. My oldest turns 18 this week and I feel like I just brought him home. It really does go by so, so fast. Thus, the fact that our government, urged on by busybodies who think their parenting style is the only correct way to parent, takes away or ruins this tiny bit of precious time from mothers — particularly mothers of color — should be the shame of our nation. Fed up with the mom-shaming culture that surrounds us, I went public with my story. My very first mom friend, Rina Infelise, is a lawyer who defends DCFS cases. Her advice: Don’t go public with the story because DCFS will come after you. This just drove me on. So, how do you handle incrementally giving your child confidence? The post BEWARE of Parenting Under ‘Nanny State’ Next Door Neighbours – if this sounds crazy to you, that’s because it is. appeared first on Sue Atkins The Parenting Coach.